Feb 2012: This is an archived page. Please refer to SWAROVSKI ELEMENTS Library for the full updated version. 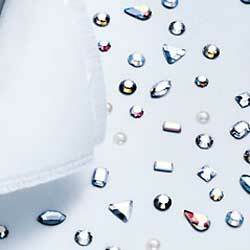 Swarovski's Flat Back Hotfix (HF) are loose crystal components with a flat reverse size. This flat size is pre-coated with a heat sensitive glue. Flat Backs HF can be easily applied to a range of textile material, producing durable and long-lasting shimmering effect. They are available in a multitude of colours, sizes, and shapes. Swarovski's XILION Rose is the most brilliant and most important in this group of products. We will collect a list of product items here for your easy reference. They will be sorted by their Codes. Not every item has a name but when they do, we will include it. Click on the code-link for more details of each Flat Back HF.